Whether it’s a rush buy as your current model has broken down or you fancy jazzing up the worktop with something new, there’s a huge choice out there when it comes to buying the best electric kettle. Small appliances are a great way of refreshing a tired kitchen scheme without breaking the bank, too. Here's our pick of the best electric kettles; we’ve picked the best on the market, from budget buys to top-end designer styles. For more appliance recommendations, head to our appliance hub page. There are brightly coloured designs, pastel shades, polished steel and the ever-classic black – don't be tempted to over-match your appliances if you're choosing anything but white, black or steel; instead, keep all your other items neutral, and pick one colourful buy, such as the kettle. Think about the kettle size you want, both in terms of capacity and the overall dimensions of the kettle itself. As a guide, 1.7 litres makes about six to eight cups. Do you want a classic style to complement a traditional kitchen or something sleek for a contemporary look? The latest tech sees kettles being paired with Amazon Alexa for complete wireless, hands-free operation, which can also be turned on from your smartphone, too. On the hunt for a futuristic looking kettle? This glass one will do the trick. With 3KW of power behind it to deliver you a hot beverage as quickly as possible, this kettle lights up blue when boiling. Inside, there's a BRITA water filter to reduce limescale and chlorine, prolonging the kettle's life and making your drinks taste better. The filter cartridge does need to be changed every so often, however, the kettle has a built-in indicator to remind you when it's time. The boiling water capacity is one litre, plenty for four cups' worth, and it also an extremely handy one cup feature to help you be more energy efficient. Also available in pastel blue, pastel green, pink, white, cream, black and polished steel, this iconic retro design allows you to choose your preferred temperature from 50˚ to 100˚ depending on your chosen drink. Added features include a keep warm button and soft opening lid. Users like the look as much as the variable temperature, which makes this different from other models where it’s one temperature suits all. In our opinion, this is one of the best electric kettles you can buy. 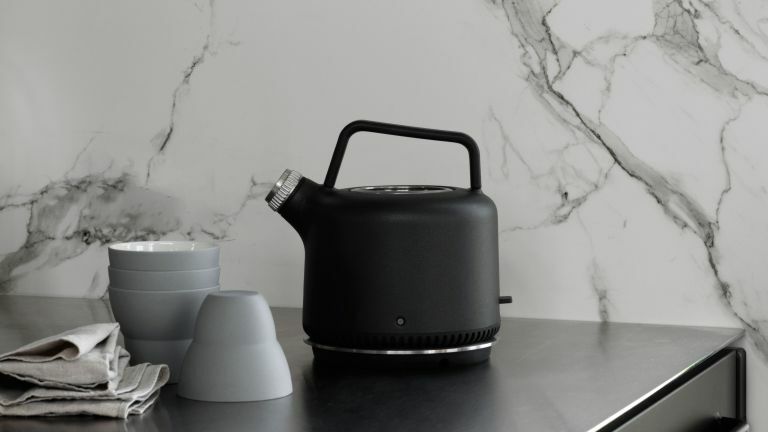 In powder-coated black steel with a grooved stainless steel spout, this Danish design kettle has double surface insulation that makes it heat-proof while keeping the water hot for longer. The best electric kettle for contemporary kitchens, this design will add wow factor to the worktop with its polished steel and grey finish. It boils water super fast and has a unique smooth pouring action that stops water dripping. Buyers love the cool blue water level indicator that lights up while boiling and it also has cup level indicators so you only need boil as much as you need. Also in White & Rose Gold as a limited edition for £129.99, this smart model allows you to put the kettle on from anywhere simply by using your smartphone. It's also an official Alexa partner so it works in sync with your Amazon Echo and features a Wake Up mode for the perfect cuppa when you wake up as well as a Home mode for when you walk through the door. Gadget lovers rave about its convenience and how clever it is. When you don’t want to spend too much, this reliable model also comes in white, red and cream and has an eye-catching ridged textured design with a high gloss finish and chrome details. It has the usual features you’d expect such as cordless operation, washable limescale filter and non-slip feet so you won’t get any surprises. Our pick of the best electric kettle if you're on a budget. WANT MORE KITCHEN APPLIANCE ADVICE?